The Bosu Ball (aka Bosu Balance Trainer) has become a popular core exercise tool. If you've read my page on core exercises, then you understand how core training has evolved as an exercise philosophy. 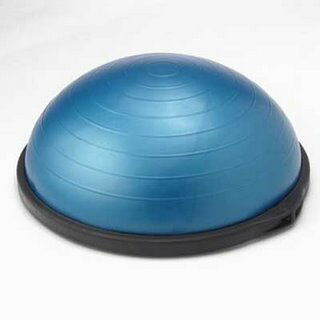 The Bosu Balance Trainer is a stability ball that is cut in half and mounted on a flat rubber platform. It the beginning Bosu was often referred to as "Both Sides Up", but now it is more often referred to as "Both Sides Utilized" because you can perform balance and core exercises on both sides. Balance is an often neglected aspect of fitness. However, having good balance is important for injury prevention, improved function, and increased sports performance. When you exercise with traditional weight machines, you don't really challenge your balance or stability or improve coordination. Since the bosu balance trainer is unstable, your core muscles must work harder to keep your joints stable. Joint stability and core stability are important for injury prevention and performance. 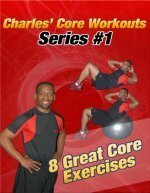 Here are some pages with Bosu Ball Ab Exercises, Core Exercises, and Lower Back Exercises. Below are some sample videos of balance and core exercises that you can do on the bosu balance trainer. This first video give you a taste of how the bosu balance trainer can be used as a cardio tool for warm ups or cardio workouts. This next video gives you an example of how you can utilize the Bosu Balance Trainer as a stability tool during weight training or core exercises. This is just a sample of what you can do with a bosu balance trainer. I use it with my clients mostly for core exercises. Another tool that I use very often is the Reebok Core Board. For balance exercises, I tend to use the Reebok Core Board more often then the bosu balance trainer, but these tools are both great pieces of core exercise equipment. Remember to have fun with your core workouts and don't neglect balance exercises.